Get involved this Spinal Health Week (20-26 May) to help raise awareness of the importance of being Ready For Life, so more Australians can continue to do the things they love for longer. ACA will release weekly blogs in the lead up to Spinal Health Week. This is a great resource with information and tips to improve your posture, keep active and information on how chiropractic can help. To read Spinal Health Week blogs click here. Tell us in 50 words or less 'how chiropractic helps you get Ready For Life', for your chance to win over $700 worth of prices including a Garmin Fitness Tracker, BOSE Wireless Earbuds and a Sunbeam StickMaster. Competition closes 5pm AEST 26 May 2019. 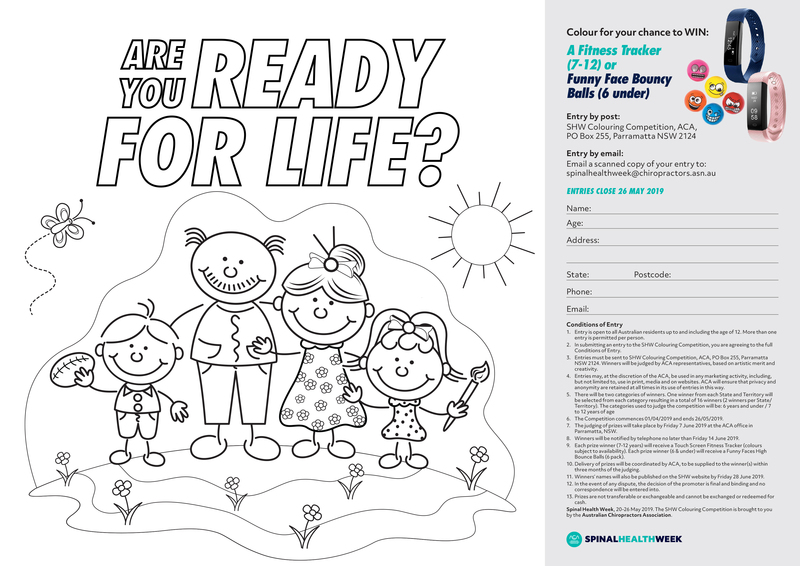 Get the kids involved this Spinal Health Week with a fun colouring competition for their chance to win either a Fitness Tracker (7-12 years), or a Funny Face Bouncy Ball set (6 Under). Winners will be announced on Friday 28 June 2019. Use the hashtag #ReadyForLife to be involved with Spinal Health Week on social media and be a part of the conversation. Be sure to follow us on Facebook, Twitter and Instagram to keep up-to-date with the latest updates and discussions.